Though he may not be able to come and stay, this mat will certainly invite your family and friends to. You may have a Bad Dog® on your hands, but he sure does make visitors smile. 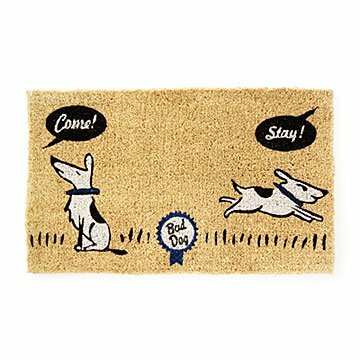 This playful coir design celebrates the follies of training your pup, who does the exact opposite of the commands being barked. He also keeps you and your guests from tracking dirt into the house, and brings a bit of humor and wit into the everyday. Though he may not be able to come and stay, this mat will certainly invite your family and friends to. Made and decorated in India. Complete your litter of Bad Dog® with glasses, diner mugs and coasters! Best maintained under protected area. Shake mat to loosen any dirt. The doormat is 100% coir, with the underside showing the woven fibers. Doormat is 1" thick so make sure to measure the clearance of your door to be sure it will fit. Really cute, but does not hold up well in weather. Because I thought this was cute, and it's a great way to let people know I have a dog, I bought this mat. It arrived promptly. The colors were very vibrant; however, after one summer in the sun it faded really fast. You can no longer read the words or see all of the dogs.